Lisbon is a beautiful city set on a hillside overlooking the Tagus River, which flows into the Atlantic. Lisbon's hilly streets and large suspension bridge over the Tagus have caused some visitors to compare the city with San Francisco. Lisbon even has its own famous earthquake, which destroyed much of the city in 1755. Cruise ships sailing along the western coast of Europe often include Lisbon as a port of call, and some cruises either embark or disembark in Lisbon. I have visited Lisbon four times, from the Crystal Symphony, the Silversea Silver Whisper, the Wind Surf, and the Viking Star. Each time I would like to have had more time to explore Lisbon and the surrounding countryside. River cruise tours on the Douro River in Spain and Portugal often embark in Lisbon, so that's another great way to see the city. Be sure to be out on deck when your cruise ship arrives or sails away from Lisbon. The bridges and monuments along the Tagus River are historical, fascinating, and beautiful. Lisbon's Belem Tower was built from 1515 to 1520 and once served as a watchtower for Lisbon when it stood in the middle of the Tagus River. 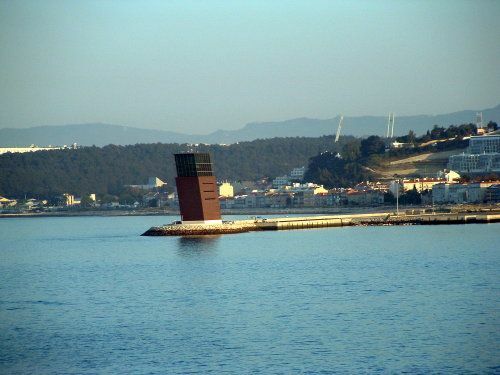 Today the river has changed its course and the Belem Tower sits on the river bank. The Belem Tower serves as Lisbon's symbol of the Age of Discovery, often serving as a symbol of the country. UNESCO has listed the Belem Tower in Lisbon as a World Heritage monument. The Discoveries Monument (or Monument to the Discoveries) was built in 1960 to celebrate the 500th anniversary of the death of Prince Henry the Navigator, who sponsored many of the Portuguese explorers of the 16th century. The Discoveries Monument has statues of all the great Portuguese explorers such as Vasco de Gama and Magellan. The monument also has a map that chronicles Portugal's empire building around the world. The Jeronimos Monastery was built by King Manuel in the early 16th century. Sailors leaving for exotic locales and exploring unknown lands would usually spend their last night ashore in the Monastery. I found it interesting that King Manuel used a special 5 percent tax on spices from India to pay for the Jeronimos Monastery. Some things in politics never change! The 25th of April suspension bridge in Lisbon, Portugal is one of the world's longest suspension bridges at 1.5 miles (2.2 kilometers) long. Built in 1966, its reddish-orange color makes it look like San Francisco's Golden Gate Bridge. However, other than the color, it more closely resembles the San Francisco-Oakland Bay Bridge, and was constructed by the builders responsible for this "other" Bay area bridge. The 25th of April bridge was originally named for Portugal's right-wing dictator, Antonio de Oliveira Salazar, who ruled from 1932 to 1968. After Portugal's 1974 revolution, residents who supported the revolution started calling the bridge the 25th of April bridge to celebrate the change in power on April 25, 1974. Citizens loyal to Salazar's party continued to call it the Salazar bridge, and those who didn't want their politics known just called it "the bridge over the river". The 25th of April suspension bridge was modeled after the San Francisco-Oakland Bay Bridge in San Francisco. The Statue of Christ (Cristo Rei) is across the Tagus River from Lisbon. Citizens of Lisbon who were grateful that Portugal did not join the fight in World War II built the statue as a thanks to God. The statue is a replica of the Statue of Christ the Redeemer on Corcovado in Rio de Janiero, Brazil (although smaller). The Praca do Comercio is often called the trade square, commercial square, or palace square. The Tourist Information Office is on the Lisbon's trade square, and the popular plaza serves as the departure point for tour buses. Cruise ships also used the centrally located waterfront square as a shuttle bus drop off point. The Portuguese Palace used to be on the square before the great earthquake of 1755. Today, government offices ring the plaza. The Gulbenkian Museum is Lisbon's best. Gulbenkian was an Armenian oil tycoon who donated his collection to Lisbon because of the kindness of its citizens. The Gulbenkian Museum has 2,000 years of art from Egyptian to modern times. We were told that these workers were constructing an urban transit system. At the rate they were working, it may take a few centuries! The Santa Justa elevator in the Baixa District of Lisbon is one of the city's most famous sites. The Santa Justa is 45 meters (over 150 feet) tall and was built in 1892, a few years after the Eiffel Tower. In hilly Lisbon, the Santa Justa was built to connect the lower town with the upper town. Rossio Station is one of the four train stations in Lisbon, and it is located in the city center. The entry way to the Rossio Station looks like two horseshoes, doesn't it? The Castle Sao Jorge is Lisbon's castle, and it has a great vantage point overlooking the city.